The latest data released Tuesday by NPD DisplaySearch forecasts that 19.8 million touch-enabled notebook PCs will ship this year. That would account for about 11 percent of all notebooks shipped in 2013. Touchscreen notebook shipments have also grown throughout the year, from just 7 percent in the first half of 2013. Manufacturers have been most likely to put touchscreens on their "ultra-slim" PC models, giving users the option of tablet-style utilization. Asus has been the most enthusiastic in embracing touchscreens on notebooks, with 20 percent of its laptops now sporting touch-capable displays. That's also helped Asus to carve out a 26.3 percent share of the touch notebook PC market, according to NPD. For Sony, 17.6 percent of its notebooks shipped worldwide are touch-capable, but the Japanese electronics maker has managed to take just an 8 percent share of global notebook PCs with touch. In contrast, just 7.4 percent of Lenovo's total notebook shipments sport touchscreens, yet it has a 14.7 percent market share. One company that has signaled it has no plans to add touchscreens to its existing notebook lineup is Apple, as its executives have panned Windows 8 "convergence" PCs that aim to offer the benefits of both a laptop and a tablet. Apple has instead kept its iPad and MacBook lineups separate, with different operating systems and interfaces suited to each device. In one of his company's quarterly earnings conference calls in 2012, Apple Chief Executive Tim Cook compared hybrid tablet-notebook devices to that of selling a refrigerator with toaster functions tacked on the side. Such combinations are not "pleasing to the user," he said. "Anything can be forced to converge," Cook said. "But the problem is that the products are about tradeoffs. You begin to make tradeoffs to the point where what you have left at the end of the day doesn't please anyone." Though Apple doesn't see much of a market for notebook PCs with touchscreens, NPD still projects that their share of shipments will grow in the coming years. 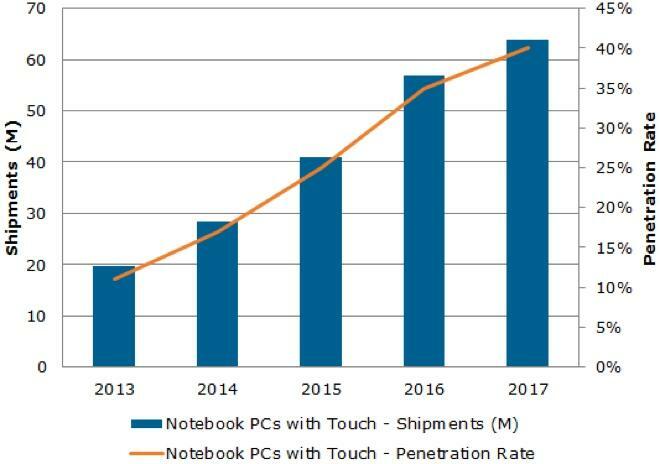 The company's forecast sees notebook PCs with touch reaching a penetration rate north of 40 percent by the year 2017.